Books and magazines may be loaned to current Guild members and may not be taken out of state or loaned to non-Guild members, except to workshops as approved by the Librarian. Books and magazines may be checked out for a one month period and renewed for a second month unless another member is waiting to use the book or magazine. The overdue fine of $1.00 per month payable to the Librarian. If you can not attend a meeting to return a book, return it directly to the Librarian or call/ email to renew it before it is overdue. When checking out a book, please fill out the library notebook kept by the Librarian. On it you will list your contact information and date you checked out your book. When you return a book, please list the date of return in the library notebook and refile your book. Magazines in the plastic envelopes are limited to one envelope per person per month. Please do not remove the individual magazines from their envelopes as they are better preserved this way. Some instructional videos and DVDs are also available in the library and can be checked out the same as books. 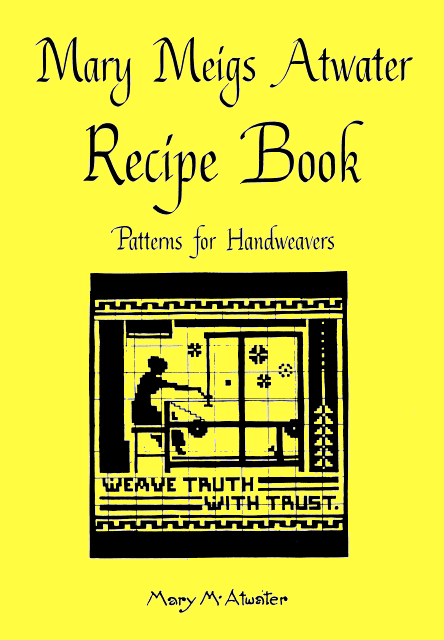 Mary Meigs Atwater's "Recipe Book: Patterns for Handweavers" is available on CD from the Mary Meigs Atwater Weaver's Guild for $15 plus $1.50 shipping. To order a CD, send an email to Judie. Please send a check for $16.50 to Susan Hainsworth, 91 East 400 North, Centerville, UT 84014. The CD contains PDF files for the entire book and each chapter. Since the book is in black and white, you can print the entire book or the page that you want. WIF files are included for all of the drafts in the book. The profile drafts are also included where possible. Weaving software programs or demo programs will open WIF files. Plus more. Questions about the CD or files can be sent to Judie.